The Sword Buyers Guide Swords series were created by Paul Southren, who began his website, Sword-buyers-guide.com, in 2005 with the intent to create a space not just for detailed sword reviews, but also for learning. SBG was intended to make buying swords on the internet a an informed decision, backed up with accurate information. The primary focus of this website is to find, and shine a spotlight on those swords that could only be classified as “real” swords. This meant these swords had to be able to perform the task assigned to swords, namely, cutting things. However, as swords can cost anywhere from $15, all the way up to a $40,000, it was important to Paul that the swords that qualify fit into a reasonable price range. As part of this vision, Paul also established an online store that would work in conjunction with the rest of his website, and carry only those swords which Paul felt were in keeping with his objective. Some time later, SBG began to offer their own exclusive line of swords that met Paul’s rigorous standards. Sword Buyers Guide swords are made from T-10 tool steel which has, time and again, demonstrated its durability and resilience. This steel has been demonstrated to cut anything from water bottles and pool noodles, to more traditional targets like tatami omote. However, this is not the upper bounds of what T-10 can handle. The Sword Buyers Guide swords have been demonstrated to have, on at least one occasion, cut through: tree branches, dry wooden logs(with the grain), and even part of the way through oil barrels. These blades’ ability to endure these sorts of beatings is not only due to the quality of steel, but also due to the differential heat treatment these blades are given. Though the blades play a central role in Paul’s vision, it is by no means the only detail accounted for. The hilt, scabbard, and fittings are each paid a great deal of attention towards ensuring good quality, appearance, and utility. A semi-customized Katana made from T-10 tool steel with natural hamon, the SBG Custom Katana project began in 2008 by “batching” together customers orders and sending them to a boutique forge in Longquan, China. Now in it’s third generation, the current Custom Katana has a wide selection of either iron or high quality work hardened copper fittings and many possible handle wrap and saya combinations. Price is $429.99. 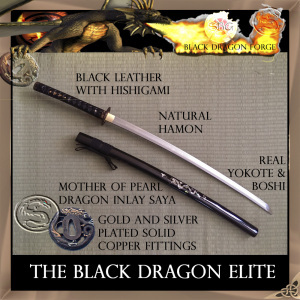 An offshoot of the custom Katana, SBG began to stock a popular customization option that would appear time and time again – and all black, dragon themed sword (hence the name). Several other designs by Paul Southren were to follow, all based around the same high quality T-10 tool steel blades. Available in limited quantities several times a year, some designs are one off’s and others perennials. Probably the biggest issue is lead time between placing an order and receiving the finished product. While SBG aims to have all swords in the customers hands within 90 days, delays at the forge or with customs can push this lead time back by a month or two. Additionally, while great care is taken to ensure accuracy, the occasional error is unavoidable – and when it occurs, can cause further delays as the sword will need to be remade from scratch. Various propriety systems are in place to minimize and quickly recover from any possible mistakes, so while delays may and do occur – satisfaction is promised with each order and, especially considering the low price point for a semi-custom sword. Other known issues are what you might typically expect on swords below the $1000 price point – such as minor tool marks on the blade, imperfect polish, etc – though again, customer satisfaction is a top priority and much effort is made to ensure the best possible product for the price. 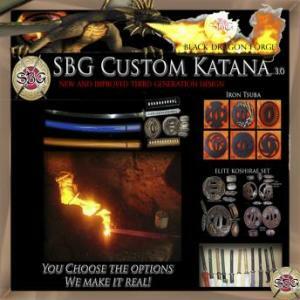 The SBG Custom Katana swords are exclusively available at the SBG Sword Store HERE while the Black Dragon Forge swords, also exclusive to SBG, HERE respectively.